Northwestern’s newest residence hall at 560 Lincoln St. The Undergraduate Residential Experience Committee released a report Thursday recommending the University implement a new “neighborhood” framework for housing. 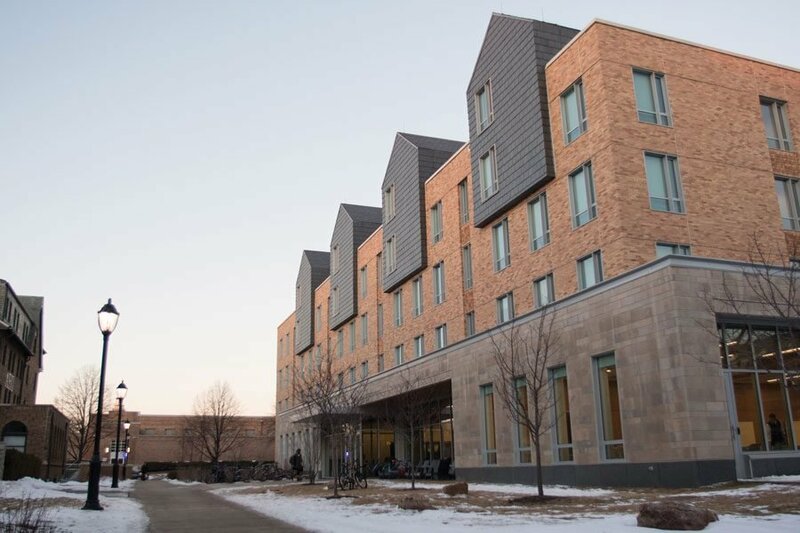 Nearly two years after it was formed, the Undergraduate Residential Experience Committee released its full report, recommending that Northwestern move from its current residential model to a new framework of five different “neighborhoods” across campus. The committee — made up of faculty, staff and students — was initially formed under a charge from Telles-Irvin, and convened in January 2016. In a change from the current model of residential halls, residential communities and residential colleges, the proposed framework would have “houses” — the report suggests a size of 75 to 150 students — within the wider neighborhoods of 700 to 1,100 students. Smaller buildings currently in existence would be standalone houses, while some larger buildings may be divided into two or more houses. The neighborhoods would aim to “universalize” many aspects of current residential colleges, according to the report. Paul Riel, assistant vice president for Residential and Dining Services and the committee’s co-chair, told The Daily the student-faculty connections, student governance systems and emphasis on programming and traditions are all things the neighborhood model would hope to emulate. However, the report recommends eliminating permanent themes for residential units — like those carried by most current residential colleges — saying these could be a “limiting factor” for student and faculty interest. Instead, houses should include informal “interest groups” that could change from year to year, according to the report. Members of residential colleges had previously voiced concerns about the proposed neighborhood model at town halls held by the committee in October 2016. Jolie Boulos, the president of Public Affairs Residential College, said she believes the neighborhood system is “well-intentioned,” but that it would not be able to recreate the “bonding experience” of the residential colleges. Creating interest groups is not the same as having freshmen come into a community already knowing they will share interests with their fellow residents, she said. Greek houses would also be incorporated into the neighborhoods, according to the report. Living in Greek housing would count toward the new two-year University live-in requirement, and students in Greek houses would have access to neighborhood resources — although Greek houses, like some other smaller buildings, may remain private to residents. The report describes the integration of Greek houses as a “uniquely Northwestern” feature of the proposed framework, as the committee did not find examples at other schools that brought Greek housing into a residential model in a similar way. Other recommendations in the report include incorporating a new “University Resource Adviser,” expanding the shuttle system with stops in each neighborhood and working toward consistent costs across housing options. Riel said he is “optimistic” the report’s release will spark a conversation on campus. Following the release of the report, Riel said, the next step is to hold a series of dialogues during Winter Quarter to hear opinions on the report that could be incorporated into the recommendations. Though the report says the new model could begin to affect student housing as soon as 2018, Riel said it is more likely that “actionable items” will be implemented in fall 2019 or later. In a Thursday email to The Daily, Holloway said many of the details of the new plan are still being determined. Though this means it is too early to assess the cost of the framework, he said he does not predict the projected deficit in the University’s budget next year will affect its implementation.